The Skinny: Creative sequel to the original Running Out of Time goes so far to top the original that it becomes an outright parody. Clever and witty at times, but also ridiculous and completely unnecessary. To some fans, this movie may be downright intolerable. A sequel to Running Out of Time makes some sense. It's Milkyway's most successful crime picture (save Fulltime Killer) and has one returning character that's guaranteed onscreen gold: Lau Ching-Wan as the driven Inspector Ho. All that's needed is a worthy foil to replace the departed Andy Lau. Enter Ekin Cheng, desperately in need of a career makeover after too many Chan Ho-Nam retreads. The result: Running Out of Time 2, which features Cheng as a suave, too-cool thief who drags Inspector Ho into his criminal scheme presumably to make things more interesting. Interesting it is, but logical it most definitely is not. Cheng's bad guy is more magician than mastermind. Showing up on top of a highrise, he proceeds to dare Inspector Ho to stop his upcoming crime spree. Then he goes and pulls the first of many disappearing acts, which are usually accompanied by green smoke or some other sort of diversionary tactic. He also trains birds of prey, walks tightropes, and owns an extensive collection of mirrors. His goal is 20 million HK dollars in ransom money. His collateral: three invaluable artifacts insured by Kelly Lin's company. His methods are completely nonsensical, ranging from invading police headquarters to getting the cops to counterfeit the cash. Then he has Inspector Ho chase him from one end of Hong Kong to the other, all the while smiling like a little kid playing "tag" during recess. Why this matters is unknown. 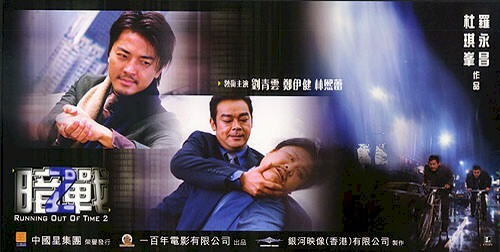 Apparently, everything that occurs in the film is to satisfy the whimsy of Cheng's mischievous thief. Why is he doing this? Is it for the fun? Or is he simply bored? No answers are provided and Cheng does little to clear things up. Cheng's method acting consists of smiling a lot and providing zero insight as to why this whole thing is happening. The motivation for the crime is ostensibly charity, but it's more likely that he simply wanted a partner to run around the playground with. If arrested development were a crime, then this guy would deserve the death penalty. At the very least, Lau Ching-Wan proves game. Director Johnnie To's usual cohort is at his most charismatic and engaging, and manages to bring some resonance to the cop-criminal bond that is the central relationship of the film. You can see his Inspector Ho enjoying every minute of the chase despite its inanity. Kelly Lin provides the heterosexual love interest, which is great because she doesn't provide any acting. Hui Siu-Hung returns as Assistant Commissioner Wong Kai-Fat, who apparently had a lobotomy between the original and its sequel. And Ruby Wong puts in another cameo, of which she's been quite guilty of late. She deserves more than to window dress these various crime films (Hit Team, Running Out of Time).